Deborah Grantham is well born, well-bred and ever so lovely. None of this matters, however, in the game of love and matrimony in Regency London, because Ms. Grantham earns her living playing cards in one of London's finest gambling houses. And marriage with such a gaming-house wench is just not done, especially not in the echelons of the "ton." Young Lord Maplethorpe is willing to flaunt society and risk its censure to marry the beautiful Deborah for love. His unhappy mother seeks help from her stepson, the handsomest, cleverest, richest man about town, Max Ravenscar. This unrelenting bachelor meets Deborah, his new foe, across the faro table where they play for power, although they wager for money. And proud Ms. Grantham gives Ravenscar a run for his money as she proves to be more stubborn and high principled than he in this delightful romantic farce. 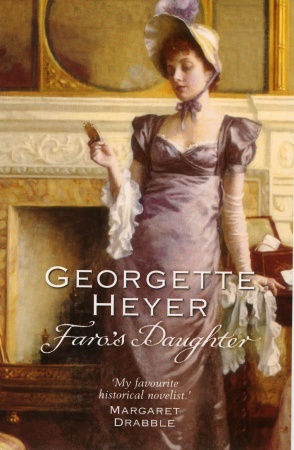 Georgette Heyer writes one of her best novels with "Faro's Daughter." The witty dialogue, the power plays between the intelligent Deborah, who does not want to be beholden to anyone, let alone to the arrogant Lord who is so willing to believe the worst of her, and the creative subplots and adventures showcase her talent. This is a winner, and a must read for all Ms. Heyer's fans!